That was it for me this past week. 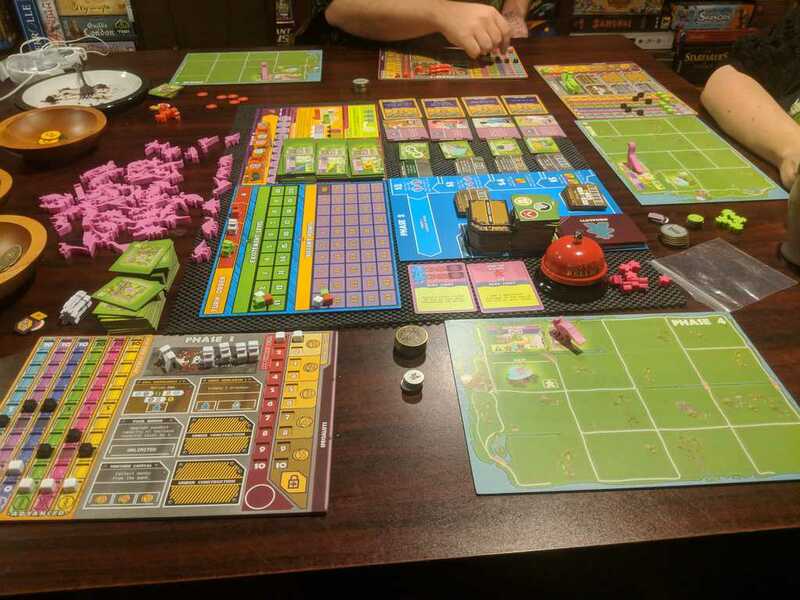 I noted last week that I wanted to play Dinosaur Island at least one more time, and with more than two players, before I shared my thoughts on it. Well last Monday I got in that one more game. We played a three player game using the short game goal cards. This was the first play for one player, Sean (Hamilton, not from Hamilton) and the second for D and I. It went well enough. 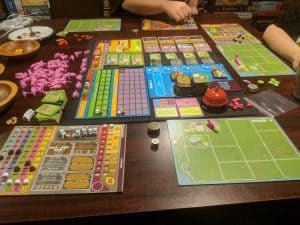 That first two player game really helped my ability to teach this game and we were up in record time. In Dinosaur Island you are basically running Jurassic Park. Your scientists research Dino DNA and try to create new dinosaurs for the park. You upgrade your labs and increase your ability to produce and hold more dinos as well as increasing your park security. You add attractions to your park, things like food stands and roller coasters. You hire specialists that help you get all of this done and increase your workforce. The base mechanic is two separate worker placement phases (one for your scientists and then a later one for your park workers) separated by a market phase (where you buy upgrades and attractions. That is followed by a rather unique park phase where you pull meeple out of the bag to represent visitors to your park. While there is a lot going on and a lot of phases to think about, each individual action is rather simple to carry out. The game looks intimidating but after the second round you start to realize just how simple it is. Part of this is that you are rather limited in the actions you can take, and unlike many of these kinds of games, the number of options doesn’t grow as the game goes on. So far I like it but I don’t love it. I’ve only played the learning game and this one quick game and I’ve got to say they aren’t kidding when they say quick. The learning game only went three turns and I think this full game using the short objectives only went four. It felt like the game was only just getting started when it ended and not in that good way that makes you want to play again right away. More in an unfulfilling, bummed it’s over already way. If the short game was the only game I would be telling you to skip this one but thankfully there are two other sets of objectives. The medium game and the long game objectives and I really think a longer game could be needed for Dinosaur Island to shine. 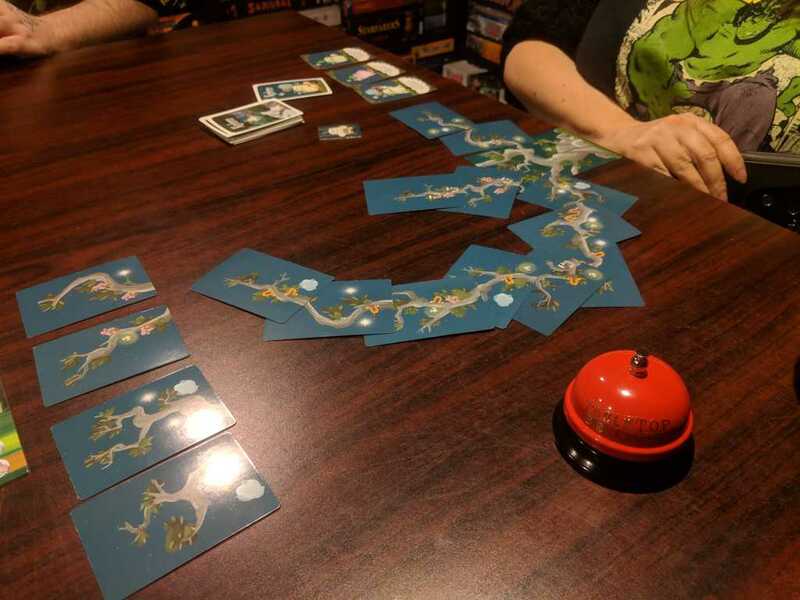 I first played Kodama at Origins 2015. My wife and I did a full demo game at the Indie Boards & Cards booth. While we both enjoyed the game we agreed that we thought the price, there at the con, for the game was too high for what it was. If I remember correctly they were selling it for $35US. Fast forward many years to last weekend when my friend Ross decided to part with his copy of the game for $10. Now that’s a price that I think is totally worth it. Kodama is a beautiful card based tree building game. Every player starts off with a large tree trunk card. On that card will be one of six features. Something like a worm, or clouds, or mushrooms. Each turn players draft a branch card from a central supply of cards. These branches are added onto the players existing tree following a few restrictions (wood has to touch wood so the tree looks “real” and you can only touch the card you are connecting to and no other cards). Each branch has up to three features on it coming from the full set of six. Up to two of those features may be the same. So you could find a branch with two mushrooms and a cloud. Once branches are placed, the player scores points for sets of matching features starting from the new branch going back to the main tree trunk card. They get one point per matching feature this way with long chains of features scoring big points. Added to this every so many rounds there is a Kodama phase, where players play a scoring card from their hand. Each player gets four of these at the start of the game and during the game they will end up playing three of the four. These cards score in all kinds of ways. Number of branches, number of end branches with a feature, number of a feature X cards away from your trunk etc. There’s one other complication, each season, of which you play three, spring, summer and fall, a fairy card is drawn. This card modifies the rules in some way for the rounds played during that season. 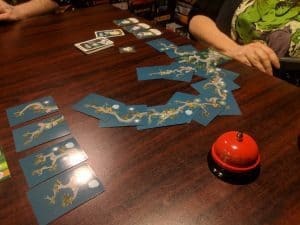 Overall Kodama is a beautiful artistic game that’s rather easy to teach but has enough meat to it to keep you interested. I think this will be a great one to teach my kids at some point. The game even includes a special set of baby Kodama to use when playing with kids or for when a seasoned player plays someone new for the first time. I liked this game from the moment I first played it and I was happy to find a copy at such a reasonable price. After Dinosaur Island, Sean asked if he could try Sagrada . He had seen it played many times but had not played himself. I’m not one to refuse a game request so we set up a three player game. At this point, I’m still playing with the base rules that come in my box. 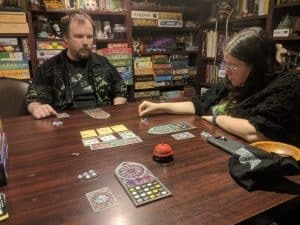 I know the last couple of podcasts we talked about how there are some rule variants on Board Game Geek for three player. I haven’t tried any of those yet. I’m still digging Sagrada a lot. I didn’t see any particular colour distribution issues this game. What I did find fascinating is that this game we didn’t have any row or column based scoring cards. So none of us had to worry about repeating colours or numbers on our patters. I’ve never had a game without at least one row/column based scoring card. It was somewhat freeing not having to worry about that. It was also the first game ever where I filled my entire window. That’s right, we fought long and hard and finally beat scenario 10. 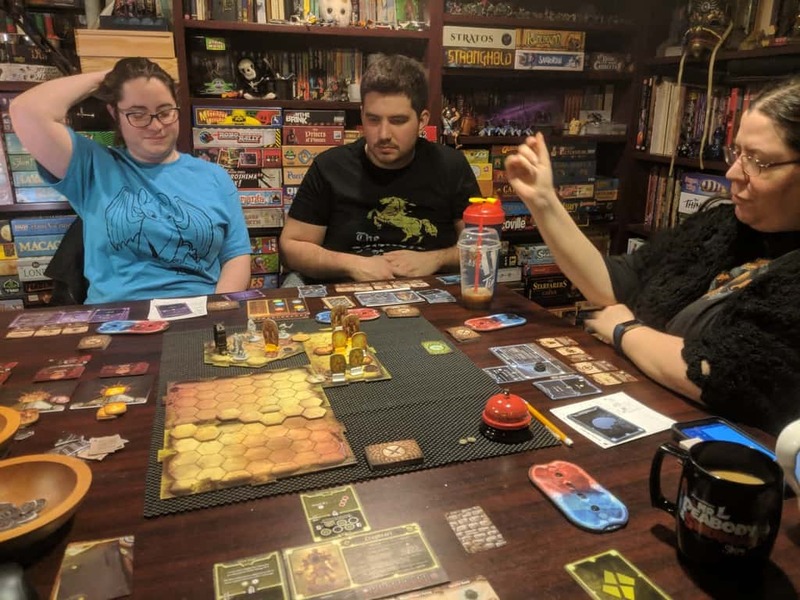 Well actually, we flubbed some rules, had our Mindthief and Spellweaver become exhausted, and still managed to squeak in a victory. Still digging the game but getting a bit frustrated by just how fiddly it is. Every game there’s some edge situation that comes up where we need to look up a rule. Usually around enemy AI. Now Sean, my podcast co-host, really likes to compare Gloomhaven to a computer roleplaying game, and thinking of it that way, it sure would be nice to have a computer move all the baddies and take care of their actions. 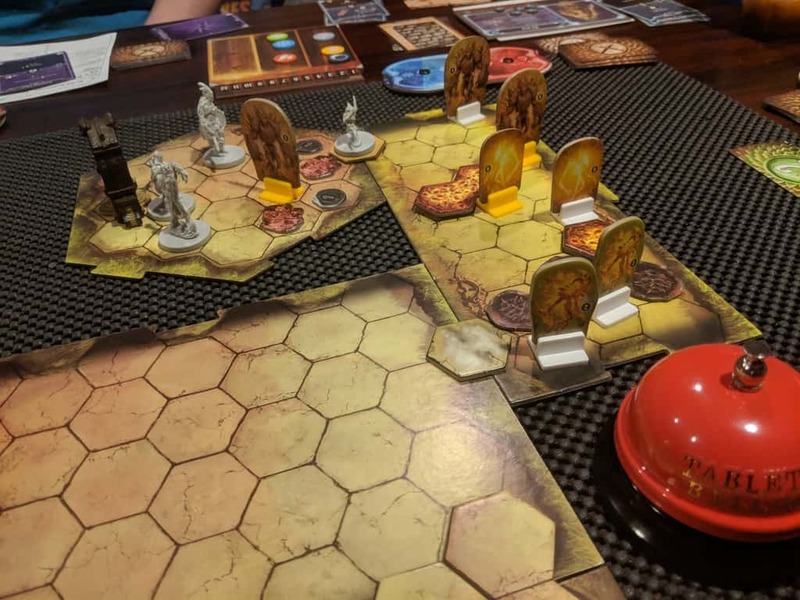 For anyone playing Gloomhaven, I suggest checking out this Basic Monster AI Quiz over on BGG. I know I already learned something by like question 4 and got many of the questions completely wrong. It taught me a lot about the enemy AI. The problem I’m having now is remembering all of it when at the table. The stream itself went well I think, after we figured out our mic problem. I also got some rather positive feedback, that is very encouraging. Remember to join us live every Friday night at 8:30pm Eastern on Twitch. Those of you who watch our show live and stick around for the Penthouse Suite after the show chat, got to see me open an Amazon package, a slightly late birthday gift from a fan. Inside that box was Azul: Stained Glass of Sintra . After the show was done Sean made a highlight clip of that part of the show and you can check that out here: Unboxing – Azul: Stained Glass of Sintra. Friday night, after our Gloomhaven game, we still had some time left in the night so I grabbed Stained Glass and we gave it a shot. This was the first play for all of us and my first time teaching the game. 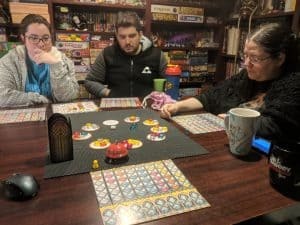 The teach was a bit rough, as the game is both like and unlike the original Azul in many ways. While I had read the rules earlier in the day I basically had to re-read them out loud for the teach. In Azul: Stained Glass of Sintra, instead of building a tile wall pattern you are building stained glass windows. The market system is set up and plays identical to Azul with each factory having four random tiles on it. Each turn players pick one tile colour from a factory and take all of that colour. All left overs go to the public market. Instead of taking tiles from a factory, players can take from the public market, again taking all tiles of one colour. There is a penalty for being the first player to use the public market, but that penalty also comes with being first player next round. Drafted tiles need to be slotted into Stained Glass Window panes and here is where the game changes a lot from the original Azul. You have eight different two sided window boards, each of which connects to your player board. On each are five spots for glass panes. These are randomized every game, which adds a significant amount of variability to set up. In addition you have a Glazier figure who goes on top of your left most pane. When you draft tiles they can only go onto a board that is under or to the right of your Glazier. When you play onto a board the glazier miniature moves to be above that board. On later turns instead of grabbing new tiles you can move your Glazier back to the first board. Scoring is also completely different and a bit more complicated than the original. Each round is assigned a tile colour randomly at the start of the game. When you fill one of your boards the first thing you do is score one point for every tile that matches the round colour. Then you pick one tile to place on your main board (below the window boards). Then you score points for that column plus every column to the right of that one that has had a window board completed. Lastly, you flip the window board over to the second side. If it’s the second time scoring a window board it is instead removed from the game. Added to this you still have rules for breakage. If you draft a tile you cannot place then it breaks. Instead of tracking this round by round on your own player board, the total tiles broken throughout the full game is tracked on a central scoring board. At the end of the game there is some bonus scoring. There are two ways to do this, one requires you to have sets of adjacent window boards completed. The other one rewards you for collecting sets of the same coloured tiles on your player board and multiples the total of those with the number of completed windows. You decided which of these bonus scoring systems to use at the start of the game. Overall, Sintra is much heavier than Azul. While tile drafting is identical, tile placement is much more strategic and scoring is kind of wonky. I would almost call it opaque. We really had a rough time figuring out what we should be doing to score points. Unlike Azul, you aren’t just going to get a bunch of points for playing tiles next to each other, it’s all about completing windows at the right time and in the right order. At this point we’ve only played once so it’s really hard to give a solid opinion on Stained Glass of Sintra. I will say I liked it. It’s definitely meatier than Azul and I like that, but it didn’t grab me instantly the way Azul did. When I first played Azul I remember thinking: this is amazing, I must go show my friends this game. I didn’t get that with Sintra. That was my list for #WhatDidYouPlayMondays. How did you do? Anything awesome hit your tabletop? Let us know in the comments.